Digital skills will become a core competence for the working world in the future. The path to this begins in school education and leads through academic and vocational education and training to lifelong learning. AI and innovative software technologies have the potential to improve educational and work processes in the digitalized and networked world. Be it the interaction of man and machine, the processing of knowledge from different sources or the individual adaptation of learning processes. 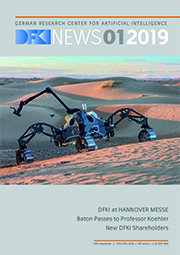 In interdisciplinary laboratories, the DFKI develops new technologies and methods to support training, qualification, teaching and learning processes in the relevant educational areas. This is done in cooperation with partners from teaching, research and science, schools, the digital and education economy as well as with spin-offs, EdTec start-ups and young e-learning companies. ARinfuse is an European project funded under Erasmus+, the EU's programme to support education, training, youth and sport in Europe.